After you receive approval for your campaign from Kickstarter, your project campaign doesn’t automatically go live for people to contribue. You have to launch it. Before you launch your project, you have a chance to review it before your campaign is live and available to potential backers. This is the last chance to adjust your funding duration and fine-tune the dates for your Kickstarter fundraising window. Your Kickstarter campaign is not live when you get the e-mail message saying your project has been accepted. The e-mail simply means your project is approved to be launched. Are you attempting to have your campaign end on a certain milestone date? If so, look at your duration and count out the number of days to identify your desired ending date and time. Make sure your duration and launch date set you up to meet that milestone end date. Do you need to avoid overlapping with holidays? As your fundraising campaign comes to a close, you’ll want to promote your deadline to backers and potential backers. You’ll have trouble capturing people’s attention during this time if your campaign ends close to Thanksgiving or Christmas, when many people are busy preparing for their holiday celebrations, or if your campaign ends around national holidays, like Memorial Day or the Fourth of July in the U.S., when people often take time off to unplug and be with their friends and families. If you see that your ending date and any substantial part of your fundraising time overlaps with an important holiday, consider adjusting the start date of your campaign to avoid the potential conflict unless your campaign specifically is related to a major holiday where people might naturally be searching for things around that topic. Are you timing your event to coincide with a major industry event or festival? This could be a worthwhile option if you think there would be a large potential audience for your project and you’re planning on attending that event or industry gathering. For example, if you’re using Kickstarter to fund a cool new app in the Technology category, and you’re attending the SXSW conference in Austin, you might want to make sure your campaign is live during that timeframe and at least a week after, so that you can alert anyone you meet to the opportunity to back your project. On the flip side, if you’re not attending or participating in a big industry event, it might be wise to avoid your campaign being live during those dates, because everyone else might be busy with the event. For example, if you’re publishing a small comic book series and you’re not attending Comic-Con in San Diego, you could face difficulty getting attention of bloggers, writers, and industry leaders during those dates because they will be covering the industry’s largest annual event. Determine what date you want your project to go live based on your funding duration. If the ending date looks acceptable, you can launch that same day. If not, consider waiting so the end date coincides with a milestone date you have in mind. After your project is approved, you cannot change the funding duration. However, just because you receive notification that your project is approved, you do not have to launch it that day; you can wait. 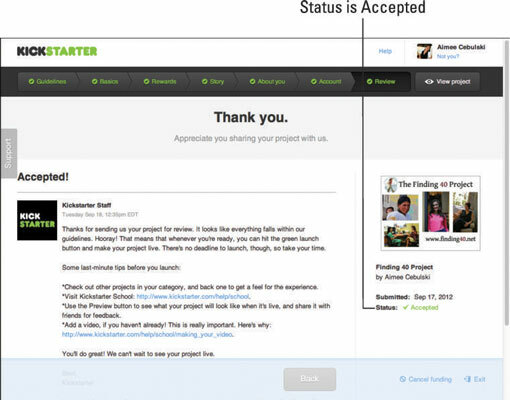 You will receive an e-mail from Kickstarter that alerts you to the fact that you’re ready to launch. To actually launch your campaign, click the link sent in your acceptance e-mail message which will take you to your project dashboard. There, you will see a new green Launch button. Click it to proceed. When your campaign is live, you’re ready to start spreading the word.